sanson is usually used to describe a trinity of Buddhist deities. This obscure haiku is clarified by its prose context in Issa's journal. 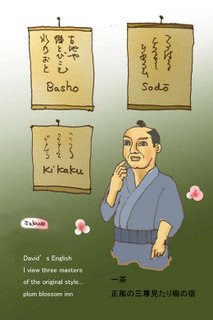 He was visiting Matsuyama on Shikoku Island, where he saw three hanging scrolls containing haiku by Basho and two other poets of Bashoo's school ("original style"): Kikaku and Sodoo. 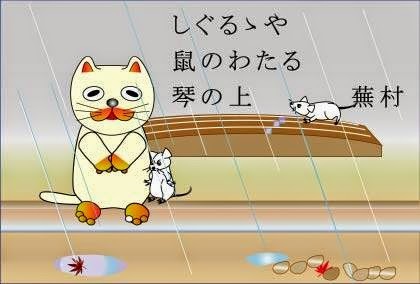 I thank Takashi Kasegawa, president of the Shiki Museum in Matsuyama, for providing information on this haiku. The three treasures are three scrolls painted by Kano Tansetsu Morisada 狩野探雪, a member of the Kano school of painting. a big drum, daikoo 太鼓.
. WKD : KIGO for the New Year . Notes:"dust on koto, koto no chiri" is after the historical fact that good sounds fluttered with the dust on the koto. Basho wrote this hokku in 1684 貞亨元年, age 41 or later. 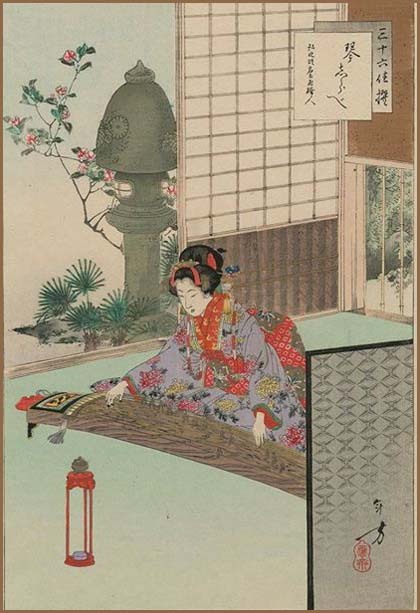 "If the koto on this painting could produce a sound, that would be the "dust of the koto". Even the birds would be surprized. Even the cherry blossoms would fall down."
. Yosa Buson 与謝蕪村 - Introduction . Is this a mouse or a rat ? Is is scampering? Tansetsu Kano drew the pictures, on that the three of Kikaku 其角, Basho and Yamaguchi Sodoo 山口素堂 wrote a caption each other, at the request of Shukuzan Hisamatsu 久松粛山 who belonged to the domain of Matsuyama. 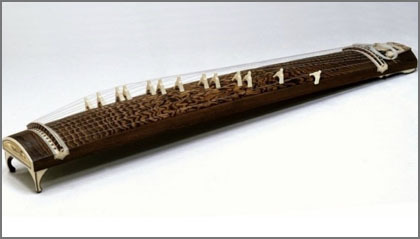 is a Japanese free reed musical instrument that was introduced from China during the Nara period (AD 710 to 794). It is modeled on the Chinese sheng, although the shō tends to be smaller in size. It consists of 17 slender bamboo pipes, each of which is fitted in its base with a metal free reed. Two of the pipes are silent, although research suggests that they were used in some music during the Heian period. is a traditional Japanese stringed musical instrument, similar to the Chinese zheng, the Mongolian yatga, the Korean gayageum and the Vietnamese đàn tranh. The koto is the national instrument of Japan. Koto are about 180 centimetres (71 in) length, and made from kiri wood (Paulownia tomentosa). They have 13 strings that are strung over 13 movable bridges along the width of the instrument. Players can adjust the string pitches by moving these bridges before playing, and use three finger picks (on thumb, index finger, and middle finger) to pluck the strings. means "drum" in Japanese (etymologically "great" or "wide drum"). Outside Japan, the word is often used to refer to any of the various Japanese drums, (和太鼓, "wa-daiko", "Japanese drum", in Japanese) and to the relatively recent art-form of ensemble taiko drumming (sometimes called more specifically, "kumi-daiko" (組太鼓)). The performances can last between 5 and 25 minutes and typically follow a jo-ha-kyū (beginning, middle, end/rapid, sudden, urgent, and emergency) structure, which means the performance will speed up significantly towards the grand finale.
. WKD : Musical Instruments . 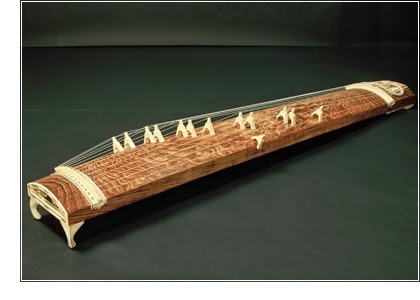 1- When making the body of the koto (a Japanese harp), its length and width are first determined, and a rounded outer surface is created in order to effectively bring out the grain patterns of the wood. To achieve this surface, positive cambers (the lengthwise arch and crosswise arch) are formed using an uchi-marukanna 内丸鉋 planing tool (a tool used for paring convex curved surfaces). The reverse, inner surface is shaved away using a chona 釿 (an adze, or edge tool) and then finished using a soto-marukanna 外丸鉋 planing tool (a tool used for paring concave curved surfaces). Next, a chisel is used to create distinctive wavy resonance patterns known as ayasugi 綾杉文様. Finally, four crosspieces, a seki-ita 関板 support piece and an itojikiri 糸じきり piece (which prevents damage to the body from the strings) are added to the instrument. 2- During the koyaki 甲焼き finishing process, a charcoal fire is built in a stove, a hot iron is heated until it glows red, and the iron is then used to sear all the surfaces of the instrument's body. 3- Decorative implements (kuchimae, shiburoku, kashiwaba, ashimawari and ura-ana/inketsu) （口前、四分六、柏葉、足廻り、裏穴「音穴」） are crafted and installed in and around the instrument's body. 4- Shinza-uchi 芯座打 involves the opening of 13 holes at even intervals across the rokubu-ita 六分板 fitting (attached to the outside of the body), and then attaching shinza (ryugan) 龍眼（芯座） to the rokubu-ita through pounding with a wooden mallet. A cloth is stretched over the lower end (ryubi 龍尾) of the koto, providing slip protection and serving as a decorative element. Written in kanji characters, “koto” (the name of the Japanese harp) may be expressed as either “so” (「筝」) or as “koto” (「琴」). However, “so” (「筝」) is now also read as “koto,” and it is used to describe a 13-string instrument. Strictly speaking, ”koto”(「琴」), originally described a completely different 7-string instrument that lacked a bridge used for heightening or lowering sound pitch. At present, of these two kanji characters, only “koto” (「琴」) is designated for everyday use. Accordingly, it is more commonly used to describe both the 13-string and 7-string instruments than “so” (「筝」). Composing music for the 13-string koto commenced with a Buddhist priest called Kenjun 賢順(believed to have lived 1534-1623), who hailed from the Zendoji Temple 善導寺 in Kurume, Kyushu. In being greatly influenced by gagaku 雅楽 (ancient court music) and kinkyoku 琴曲 (music played on the 7-string instrument), Kenjun is said to have composed koto music in the Chikushi Style 筑紫流, achieving great success at around the end of the Muromachi Period (1336-1573). 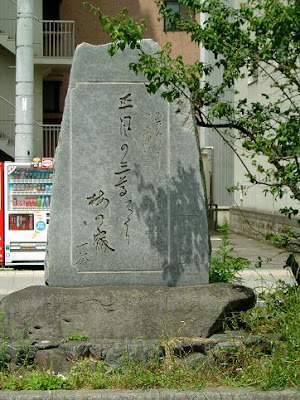 With the passage of time, the Chikushi Style gave birth to the Ikuta 生田流 and Yamada Styles 山田流, along the way it also giving rise to the Yatsuhashi Style 八橋流. A koto craftsman called Shigemoto Fusakichi 重元房吉 also transformed the instrument. He made certain improvements to the existing design in accordance with the music of the Yamada Style. Fusakichi's koto measured some six shaku (it being approximately 180cm long). This was some three sun (approximately 9cm) shorter than previous instruments. He also thickened the koto by working to add to the sound volume produced by the instrument. This was done by strengthening the camber (the longitudinal curvature of the instrument). Fusakichi also increased the size of plectrums so that the sound quality of the koto was better articulated. The features described above came to represent those of the Tokyo Koto, this instrument being widely used by both the Yamada and Ikuta Styles of koto music. Materials used in the manufacture of koto are Paulownia, Red Sandalwood and Sandalwood, etc. Furthermore, silk thread is used to make the strings. It seems likely that the making of Fukuyama Koto started at the time of the erection of a castle at the beginning of the Edo period (1600-1868) in Fukuyama, which is now a city in Hiroshima Prefecture. 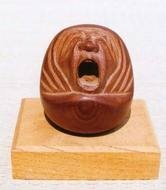 Craft industries flourished in castle towns during the Edo period, and with encouragement from the feudal lord at the time, both accompanied and unaccompanied songs were very popular in Fukuyama. In the latter years of the Shogunate and right through the Meiji period (1868-1912), superb koto players from Fukuyama appeared and trained many budding musicians. 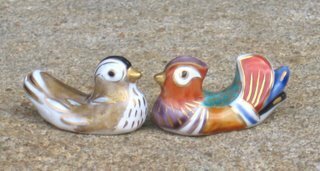 It is perhaps, therefore, little wonder that koto from this old castle town gained such a good reputation and production of these beautiful flat harps was quick to follow. paulownia (Paulownia Sieb. et Zucc.) of the very best quality is used to make these instruments which are brimming over with exquisite craftsmanship evident in the extremely detailed work. The superb tone, the beautiful grain on the soundbox and the splendid decorations are a product of the technical brilliance of the highly experienced makers of the koto.
. Hiroshima Folk Art and Craft - 広島県　. Written in autumn of 1693, 元禄6年秋, Basho age 49, or later. There is an antiques dealer, or rather a "dealer for old things" in Edo, selling koto boxes beside his usual old robes and old furniture. And in his backyard, chrysanthemume are in flower. sedo here means "back door" 裏戸、裏口. Basho is simply stating what he sees by the roadside (later termed shasei). 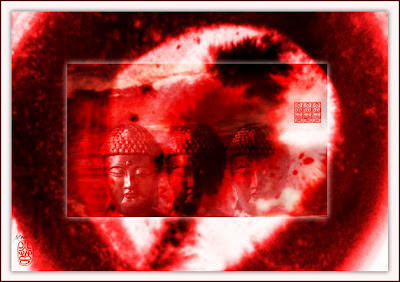 The Three Jewels, also called the Three Treasures, the Siemese Triples, Three Refuges, or the Triple Gem (त्रिरत्न (triratna)) (Pali: tiratana), are the three things that Buddhists take refuge in, and look toward for guidance, in the process known as taking refuge. Taking refuge in the Three Jewels is central to Buddhist lay and monastic ordination ceremonies, as originated by Gautama Buddha, according to the scriptures.
. WKD : Music and Haiku .
. zui-un 瑞雲文様 auspicious cloud art motives . Precious and pleasant corner of young Issa!! Thank you Gabi san for your nice work. I feel always that I must go Matsuyama, when I read your sentence.